No-frills, pay-as-you-go mobile phone service Easymobile is to close down its service next month. The company, part of Sir Stelios Haji-Ioannou's Easygroup, made the announcement to its 80,000 registered customers by text message. Sir Stelios had licensed his Easygroup brand to Danish Telecoms Company TDC, which launched Easymobile last year. But TDC said it now planned to withdraw from the UK, after deciding the format did not work with British customers. 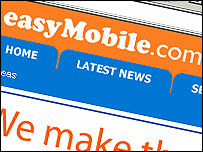 Easymobile will cease operating on 13 December, the company said in a statement on its website. Sir Stelios said TDC's decision was disappointing, but added that he hoped to find a new mobile phone network to operate the Easy brand. "Easygroup will look for another supplier to work with, I don't easily give up," Sir Stelios told BBC Radio Five Live.